In provoking conflict in eastern Ukraine's Donbass region, the current Ukrainian government is trying to shore up its position amid record unpopularity, political analyst Konrad Rekas told Sputnik Polska. The situation in Donbass has deteriorated sharply in recent weeks, as the Ukrainian army carries out offensives on areas controlled by pro-independence forces, particularly in the suburbs of Donetsk. Last week Ukrainian army shelling caused the Donetsk Filtration Station to lose power, leaving the city's residents without a clean water supply. The army also struck the Avdiivka Coke Chemical Plant, causing its output to more than halve, choking off the energy supply to local residents. 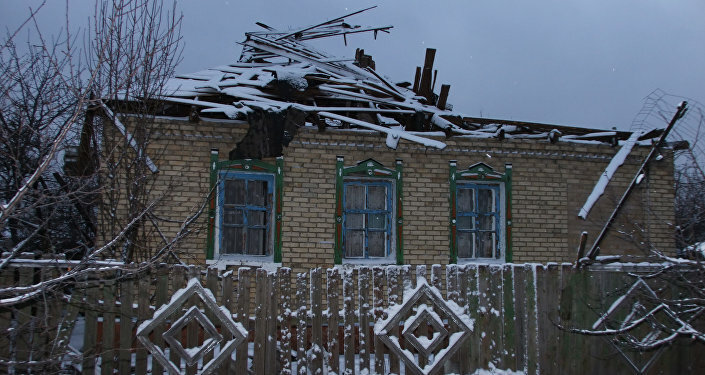 The army's use of heavy weapons, including heavy artillery and multiple launch rocket systems, to shell residential areas is in breach of the Minsk Agreements agreed in February 2015. In light of Kiev's desire to incorporate the region into a centralized power structure, there seems to be little logic to the aggression against Donbass, where residents are in favor of a federalized Ukraine giving them a special status. However, political analyst Konrad Rekas told Sputnik Polska that there are in fact several explanations. "When the shelling of Donbass began and the Ukrainian army began an offensive on the positions of the (self-declared Donetsk and Lugansk) People's Republics, theorists put forward three versions of what is happening. (First,) Ukrainian provocation, (second) a provocation from the Ukrainian military to demonstrate that Poroshenko doesn't have real power, and the third, that Ukraine's actions seem not to be agreed with the current US administration but the previous one, in order to aggravate Russian-American relations and disrupt the emerging reconciliation," Rekas said. "The doubts were dispelled in part by Poroshenko himself, who said that this was first of all about the failure of the procedure to lift sanctions, because if there is a war, the lifting of sanctions can't be considered. A war, which he himself is provoking and supporting. Which of these versions is the most reliable? I think all of them, in one way or another. In the context of the prevailing chaos in Ukraine it is hard to say for sure." US President Donald Trump has expressed a willingness to work with Russia in the fight against terror, and a readiness to lift anti-Russian sanctions in return for co-operation in other areas, such as a reduction in nuclear arms. France and Germany have also expressed a desire to lift sanctions against Russia, but have linked this to the implementation of the Minsk Agreements, which Russia is a supporter of, but not a party. Rekas outlined Kiev's pattern of behavior, which tries to ensure periodic conflict in its eastern region in order to maintain international support and the sanctions against Russia. "Even a disinterested observer could notice how events unfold every time — Ukraine starts a new action, the forces of the (self-declared) republics try to the last to respect the ceasefire, there are triumphant reports from Kiev, 'this is our victorious offensive, this time we will win.'" "Eventually, the People's Republics can't hold out and begin to react. There is a successful counter-attack, military resistance, the Ukrainian army loses. At this point, Kiev begins to wail and require assistance from the international community and a return to the conditions of the Minsk agreements." "It should be noted that Kiev is not doing too badly by maintaining tension in the conflict in Donbass, and cultivating a military threat at certain intervals. Speaking of 'Kiev,' I mean primarily the oligarchs and the political and financial elite, because life for ordinary Ukrainians has got worse and more difficult. However, this doesn't bother the Ukrainian authorities." In late December Ukrainian billionaire Victor Pinchuk wrote an article in the Wall Street Journal which set out a plan for Ukraine to improve its relationship with Russia. Pinchuk, who is the son-in-law of former Ukrainian President Leonid Kuchma, said that Kiev must close the book on Crimea, proceed with elections in Donbass, and forget NATO. The article was badly received in Kiev, where the government rebuffed his proposal. The founder of the far-right Right Sector and Verkhovna Rada deputy Dmitry Yarosh responded by lodging an appeal with the Security Service of Ukraine, urging Pinchuk to be punished for "hostile and anti-government statements." Since then, Pinchuk has been tipped as a future Ukrainian President, and Poroshenko's future is far from certain given record low popularity levels of the President and his government. According to a recent survey by the Kiev International Institute of Sociology, just 13.7 percent of Ukrainians trust Poroshenko, a rating lower than his predecessor Yanukovych, and 69 percent of respondents said they distrust him. In addition, 82 percent of respondents said they don't trust the Ukrainian parliament, and almost 72.8 percent said they don't trust the government, the Russian newspaper Vzglyad reported. Rekas told Sputnik that the attention given to Pinchuk's suggestion in the US has contributed to the nervousness in Kiev that resulted in the newest Donbass offensive. "The response (to the article) is very nervous, and of course the appearance of a new political player, or rather, a new serious player like Viktor Pinchuk joining the political game, must have caused concern among the current administration in Kiev, who are already feeling like the ground is burning under their feet. This is evident by the reaction of Kiev diplomats. In Kiev they are preparing another team, changing the guard, and Poroshenko can't cope and eliminate the competition, he already knows that someone is going to stab him in the back." "Now he has started to look nervously at his partners, (trying to work out) which one of them will be first to join the camp of new winners, but no one in the group is going to sacrifice themselves for anyone else. This is an assembly of rogues, who gathered for the purpose of plundering Ukraine, ready to betray each other, and to steal." "Ukrainians can only hope that this change will be as painless as possible, and that nobody is going to drag them into a new Maidan again, which will again end the bloodshed of ordinary Ukrainians."